The holiday season is upon us and like most Americans, you’re probably digging out the Christmas lights and other decorations to show off your holiday spirit. There’s no doubt that the glow of those twinkling lights and beautiful ornaments adds to the enjoyment and festivities. However, it pays to be extra cautious when working with electricity. To help make sure your family’s decorations are safe and beautiful, follow these suggestions from Henderson Electric for purchasing, inspecting and hanging your Christmas lights this year. When shopping for new light sets for indoor or outdoor displays, be sure that the ones you select are approved and appropriate for the location. Underwriters Laboratories, or UL for short, is responsible for testing and approving electrical appliances in the US. If you don’t see the UL symbol on the box or labels of your holiday lights, discard them and replace the set with ones that are clearly marked. Like any other lighting or electrical appliance, Christmas lights that are rated for indoor use should never be used outdoors or in locations that may become wet. Be sure to look on the packaging and tags on the lights for clear indication of the set’s ratings. If you no longer have the original packaging, can’t find tags on the wiring or are otherwise unsure of your light’s ratings, only use them in dry indoor settings. Whether you’re using brand new lights for your decorating or pulling out ones you purchased previously, be sure to take a close look before you install them. If you find any of the issues described here, the safest bet is to discard the strand and purchase new ones. No amount of nostalgia is worth damaging your home or putting your loved ones at risk. Before you plug in your light sets, be sure to check the plug end. Make sure the prongs are straight and set firmly in the plug. Never attempt to force or modify a three-prong plug to fit into a two-prong outlet. There’s a very good reason for the ground prong: It protects you from electric shock! Henderson Electric Pro Tip: Still have two prong outlets in your home? Give us a call to speak to an associate about upgrading the wiring, outlets and fixtures in your home! 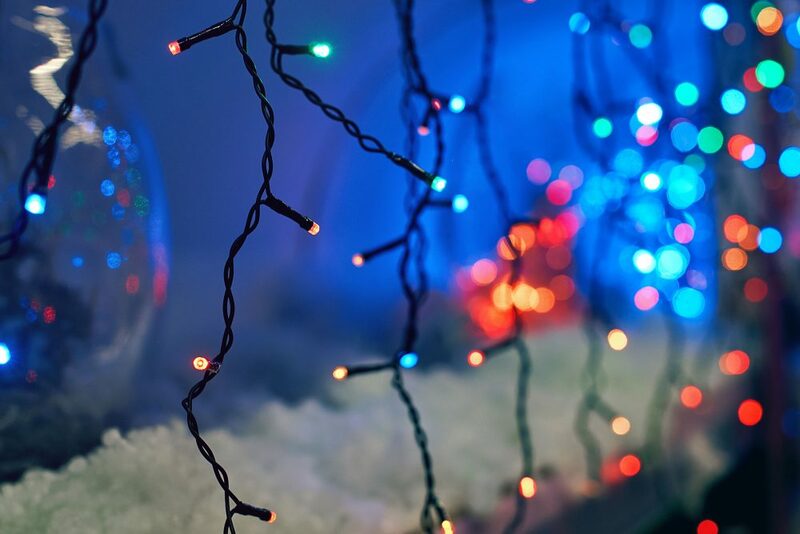 The second item you should check on your Christmas lights before plugging them in is the wires that connect the bulbs to each other and the plugs. Start at one end and carefully inspect the entire length for frayed insulation, exposed bare wires, loose connections, kinked wires or other damage. Even if electricity still flows through the set, a kinked or damaged wire can heat up to dangerous temperatures that may melt insulation or cause nearby combustible materials to ignite. The third thing to check on your holiday lights before plugging them in are the bulbs. Confirm that each individual bulb is properly seated in an intact socket, and that the bulb itself is whole and free from cracks. If you need to replace a bulb, be sure to use one with the same voltage rating. When decorating your home for the holidays, outlets are not always located close enough to your tree, doorway or other locations you want to light. If you’re using an extension cord to connect your lights to power, follow these guidelines for selecting and installing them properly. Always check the label for the appropriate use, maximum total wattage and the length of the cord. Just like lights, extension cords are rated for indoor or outdoor use. Never use an indoor-rated cord in outdoor areas or where it might be exposed to water. Be sure to inspect all cords for damage or kinks before using them. Always pick a cord that is long enough to reach your desired location without connecting additional extension cords. Using a cord that is too long is also not a good idea, as excess length increases the likelihood of someone tripping on or damaging the extension cord. Extension cords are rated to carry a certain amount of power over a certain distance. If either of these limits are exceeded, it can create a substantial fire hazard. Be sure that the total wattage of all connected lights and electrical appliances is lower than the maximum listed wattage for the extension cord. If your electrical system is experiencing issues such as flickering, shorting or non-working outlets, call the home wiring experts at Henderson Electric. Our experienced technicians will quickly identify and correct the source of the problem so you can get you back to the holiday festivities.